It's all about Earth's tilt! But what caused Earth to tilt? Long, long ago, when Earth was young, it is thought that something big hit Earth and knocked it off-kilter. So instead of rotating with its axis straight up and down, it leans over a bit. By the way, that big thing that hit Earth is called Theia. It also blasted a big hole in the surface. That big hit sent a huge amount of dust and rubble into orbit. Most scientists think that that rubble, in time, became our Moon. 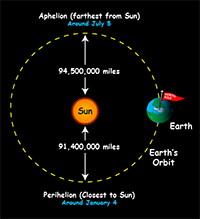 As Earth orbits the sun, its tilted axis always points in the same direction. So, throughout the year, different parts of Earth get the sun’s direct rays. If you go to South America for the winter holidays, bring your swimsuit, not your skis! It is summer in June in the Northern Hemisphere because the sun's rays hit that part of Earth more directly than at any other time of the year. It is winter in December in the Northern Hemisphere, because that is when it is the South Pole's turn to be tilted toward the sun. While that is a difference of over 3 million miles, relative to the entire distance, it isn’t much. 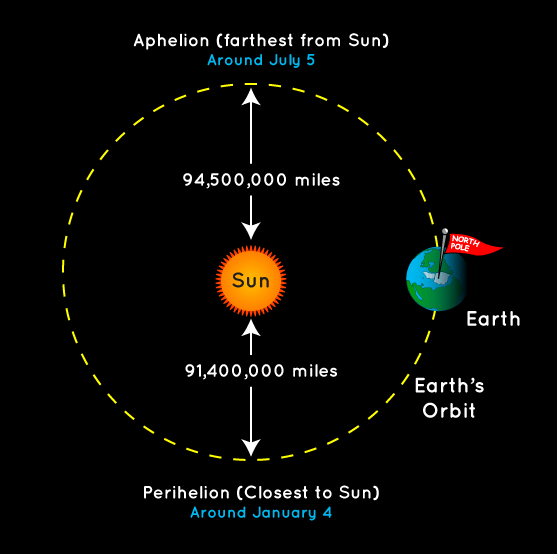 And, believe it or not, aphelion—when Earth is farthest from the Sun—occurs in July, and perihelion—when we are closest—occurs in January. For those of us who live in the Northern Hemisphere where it’s summer in July and winter in January, that seems backwards, doesn’t it? That just goes to prove that Earth's distance from the Sun is not the cause of the seasons.